Following the success of its Pixelight and PremiumSmart Series, California-based Smart TV leaders Vu Televisions introduces its ultra-stylish and luxurious Quantum Pixelight LED TV. Powered by 1500 nits, the Quantum Pixelight is the brightest LED TV in its segment. The revolutionary LED promises to deliver an immersive life-like TV viewing experience with its vibrant colour gamut and defining picture quality using quantum pixel technology. Vu’s Quantum Pixelight LED TV displays a healthy picture which is vivid and natural without having a viewer visually stressed. Currently available in 65 inches and 75 inches, the TVs are priced at Rs. 2.6 lakh and Rs. 4 lakh respectively. The Quantum Pixelight LED TV is a visual treat and is highly appealing with its impeccable industrial metal body and aesthetics. 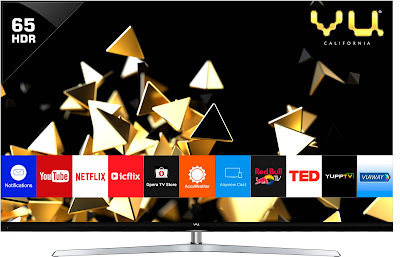 The Vu Quantum Pixelight LED TV boasts of a picture quality encompassing the ‘4 Ultras’- Ultra HD, Ultra Colour, Ultra Contrast with local dimming, and Ultra Motion. Additionally, the smart TV comes with a dynamic Dolby audio effect powered through 55,000 sound holes. The Vu Quantum Pixelight LED TV premiered at a recently held TEDx Pre-Event dinner in Mumbai. Additionally, the Smart TV is based on Vu Technologies’ user-friendly Premium Smart operating system. The products are available at VU flagship stores and Vu’s exclusive online partner ~Flipkart.